There's an oddball in most families, but Rice University physicist Emilia Morosan has discovered an entire clan of eccentric compounds that could help explain the mysterious electronic and magnetic workings of other quantum materials engineers are eying for next-generation computers and electronics. Morosan and 30 co-authors describe the first family member—a "semimetallic Kondo lattice" made from ytterbium, rhodium and silicon in a ratio of 1-to-3-to-7—in a study this week in the American Physical Society journal Physical Review X (PRX). The paper describes two properties of YbRh3Si7—"metamagnetism" and "low-carrier Kondo" effects—that have rarely previously been measured in the same material. Morosan, whose lab specializes in the design, discovery and synthesis of quantum materials, created the new family of 1-3-7's with support from the Gordon and Betty Moore Foundation's Emergent Phenomena in Quantum Systems Initiative (EPiQS). She said few 1-3-7's had been described in the scientific literature prior to her Moore-funded research. Of the several compounds in the 1-3-7 family discovered by her group, four are magnetic, three are ytterbium-based and "each is more surprising than the last," she said. "First, this gives us an opportunity to understand all of these, by themselves, and then to understand them in relationship to each other," said Morosan, who was named a Moore Foundation EPiQS Materials Synthesis Investigator in 2014. "For example, the structural and chemical differences between these are very small. The lattice parameters are almost identical. One would expect that the physical changes would, therefore, be minimal in these related compounds, but we're finding dramatically different magnetic and transport properties. If we can understand why that happens in this family, it might allow us to search for compounds with the properties we want." In YbRh3Si7 and all other crystals, atoms are arranged in an orderly way. Each crystal has its own signature structural pattern or lattice. In crystals containing magnetic elements like iron or ytterbium, the orderly arrangement of atoms in a lattice often goes hand in hand with magnetic order. For example, every electron acts like a tiny spinning bar magnet, with a positive and negative magnetic pole at either end of its spin axis. The electron's magnetic moment refers to the direction in which the spin axis points, and in elements like iron and ytterbium, which each contain many electrons, atoms can have a strong collective magnetic moment. In ferromagnets—the materials stuck to countless refrigerators and automobiles—these magnetic moments all point in one direction. In antiferromagnets, like YbRh3Si7, half of the moments point one way and half point the opposite way. Tech companies are increasingly interested in using spin in solid-state devices. Spintronics, a growing movement, is dedicated to creating spin-based technologies for data transfer, data storage and computation, including fundamentally new kinds of chips for quantum computers. For those studying new magnetic materials, like YbRh3Si7, one way to probe magnetic order is by coaxing the moments to point in another direction in response to an external magnetic field. By measuring the amount of field energy needed to change the direction that the magnetic moments point, physicists can learn much about the role that the crystal lattice plays in how the magnetic moments express themselves. In most materials, the magnetic moments of atoms gradually rotate towards the direction of the external field as intensity increases. In metamagnets, the forces of the crystal field exert such a pull that the moments stay locked in place, even as an external field is applied. But when the field energy reaches a critical level, the moments all snap instantly into a new arrangement that's more closely aligned to the field. If the field intensity is increased enough, the moments can be made to align with the field, but "only through this progression of stepwise changes that are reminiscent of a devil's staircase," Morosan said. The finding of the metamagnetic transitions was the first clue that something strange was at work in the crystallographic structure of YbRh3Si7. "There are very few examples of metamagnetism in ytterbium-based compounds," said study co-author Macy Stavinoha, a graduate student in Morosan's group. 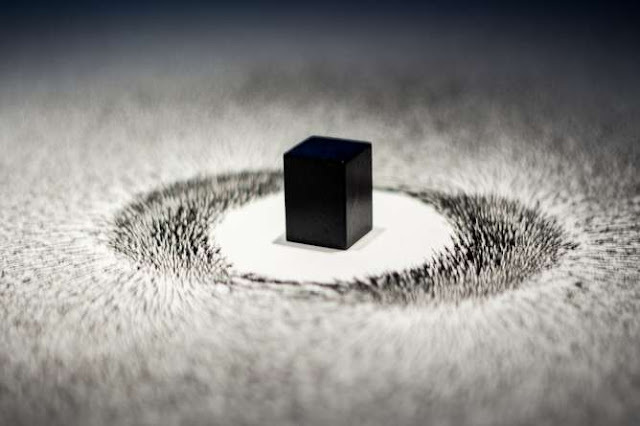 "That transition clued us into looking at the underlying magnetic structure, which was quite complicated. We had to use a manifold of techniques to confirm what was involved." The eight-year experimental odyssey to decipher the material's magnetic order was led by former Ph.D. student and co-author Binod Rai and included trips to Tennessee's Oak Ridge National Laboratory, Maryland's National Institute of Standards and Technology, the United Kingdom's Rutherford Appleton Laboratory, Florida's National High Magnetic Field Laboratory and New Mexico's Los Alamos National Laboratory. Morosan said the experiments helped her team decipher the confusing competition of forces—structural, electronic and magnetic—at play in YbRh3Si7. "There was nothing simple, in the sense that you could sit down, look at the data from an experiment and immediately tell what was going on," she said. For example, experiments showed that the metamagnetic transitions in YbRh3Si7 occurred at lower fields when the magnetic field is applied perpendicular to the zero-field moment direction. This contrasts with metamagnetic transitions in almost all other ytterbium-based compounds, which occur when the applied field is parallel to the moment direction. Morosan said this points to a delicate balance between the different energy scales in YbRh3Si7. Another example of competing energy scales in the material can be seen in the enhanced interaction between magnetic moments and conduction electrons. This interaction, known as "Kondo screening," arises when carrier electrons—the flowing particles in electric current—interact with magnetically aligned electrons in the ytterbium atoms. Stavinoha said it's puzzling because YbRh3Si7 has a lower density of carrier electrons than most known Kondo materials. "You rarely find multiple Kondo systems in one family of isostructural compounds," Stavinoha said. "In the 1-3-7 family, we discovered three such Kondo systems with distinct magnetic and electronic properties. That combination of structural similarity and physical property dissimilarity present a great opportunity for comparative studies."